The false theft and return of a fake of my favourite Colonial Latin American painting. There is no denying that Los Mulatos de Esmeraldas (called many other things including Los Negros de Esmeraldas and Los Caciques Negros de Esmeraldas) is a striking painting. 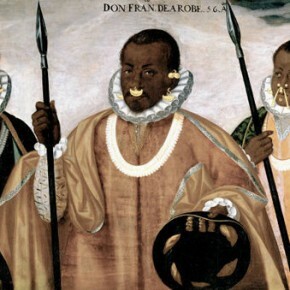 The work, which was sent to Philip III, depicts Francisco de la Arobe and his sons Pedro and Domingo, caciques from Ecuador’s Esmeraldas region. Andrés Gallque Sánchez, painting this piece in 1599, was already able to capture what was becoming the complex racial and cultural landscape of South America. Indeed, what I love most about Los Mulatos de Esmeraldas is that the three men in the photo represent the collision of three cultures. They are descendants of Africans who had escaped from a shipwreck. They are wearing European clothing. They are sporting ancient/Amerindian style Ecuadorian gold jewelry. This is one of my favourite historic South American paintings. Imagine my surprise when I discovered that, on 7 January 2014, the painting was stolen in Quito. Furthermore, imagine my surprise when I found out that on 12 February 2014, Los Mulatos de Esmeraldas was located on the 9th floor of a Quito office building by police responding to an anonymous tip. Somehow one of my top paintings had been stolen and returned in South America and I heard nothing of it for months. It was even trickling into the English language press. My dear friends, don’t trust what you read. After some careful searching, I found that Los Mulatos de Esmeraldas is in the Museo de America in Spain. I presume it has been there quite a while and has, pretty much, been in Spain since it was sent to the king at the start of the 17th century. What was stolen was a copy of the work that had been hanging in the Instituto Ecuatoriano de Cultura Hispánica in Quito. So a theft, but not a high-level cultural property theft of a historically valuable and iconic painting. I have no idea if the thieves knew it was a fake, but it seems the press largely did since the theft wasn’t really reported anywhere. Why it has come up now is some lazy reporter put it in a hyperbolic story which has been distributed around until it was picked up and translated into English. The reporters doing the translation did not bother to check the sources of the already existing article and, now, Los Mulatos de Esmeraldas has been “stolen” and “returned”. I imagine this false history will hang over the painting for a while.